Cari Ferraro: Devotion to the feminine divine as a guiding light to love and peace for all beings, rooted in earthwise practice. 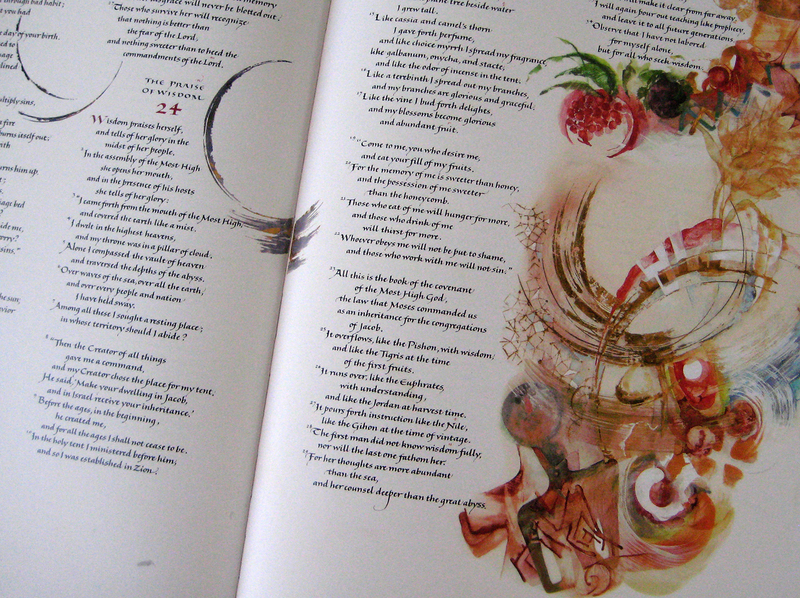 EHS: Your 2009 article “Goddess in the Bible” was inspired by the stunning illustrations of the Saint John’s Bible. How did you come to look for the Divine Feminine in the Bible, and what is your favorite depiction or story of Her in that text? CF: The Saint John’s Bible has been big news in the calligraphy community since it began in 1998. I’ve seen original pages of it at conferences, and studied with artists who illuminated and lettered it. 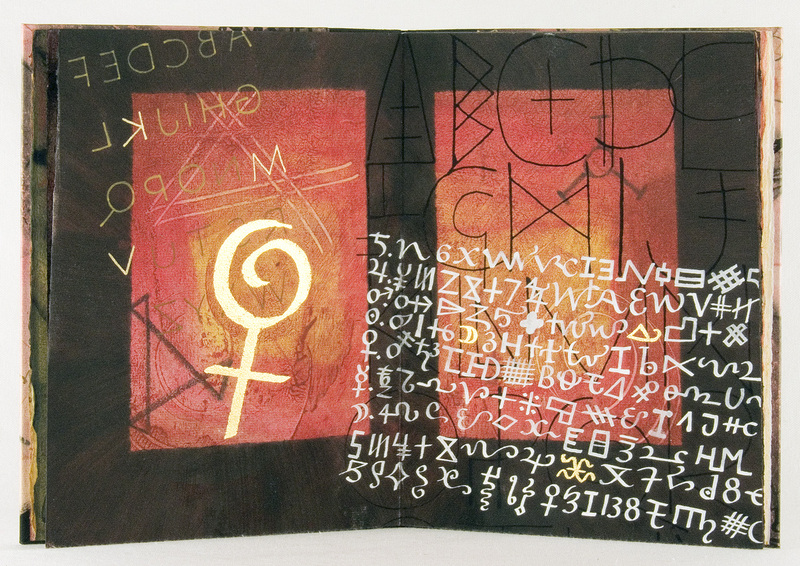 In 2004 I showed one of the illuminators a copy of my newly published limited edition book The First Writing and talked to her about the work of Marija Gimbutas, her catalog of early marks that looked like proto-letters, from cultures where huge numbers of clay female figurines were found in Old Europe. Our ancestors at that time apparently valued the feminine highly. Possibly as a result of this cross-pollination of ideas, an abstract figure with these markings appeared in one of her illuminations in the Books of Wisdom in response to the text, which is primarily about Sophia, or Wisdom, and in this edition is referred to by the feminine pronoun. So you could say that now She is my favorite (though sadly, NOT capitalized in this bible). 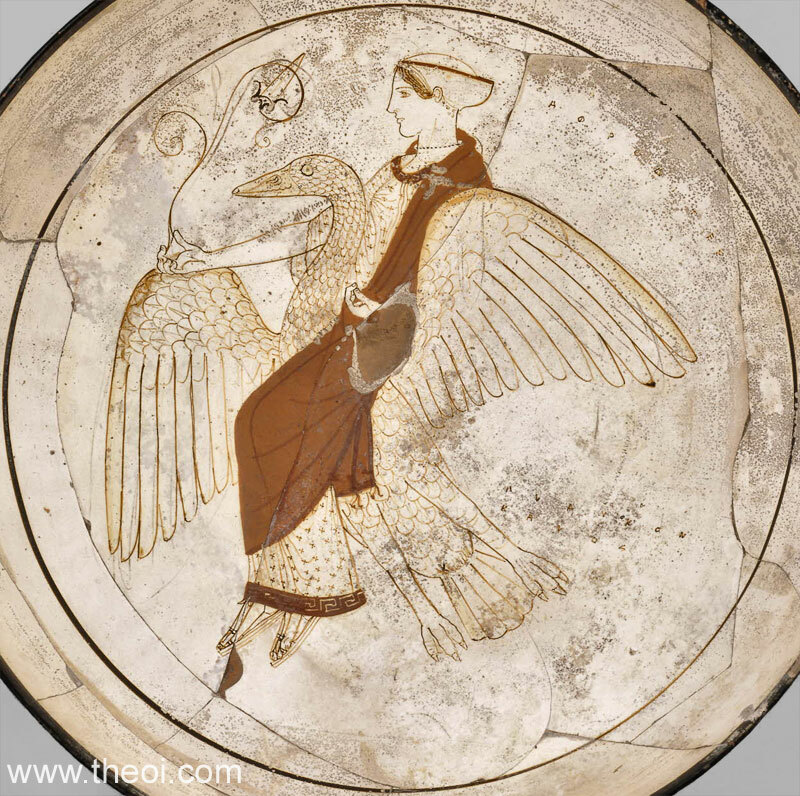 EHS: What resources would you recommend to those interested in the Biblical Divine Feminine? CF: The Red Tent by Anita Diamant is one. The Dance of the Dissident Daughter by Sue Monk Kidd. For historical context to biblical times, When God Was a Woman by Merlin Stone. EHS: Have you ever walked into a museum or gallery and just been struck dumb by the beauty of a work of art? CF: Yes, when I saw the original “Lady of Shallot” by Waterhouse at the Tate in London, it was overwhelmingly huge. I always knew it as a 16 x 20 print of a very intimate and introverted scene, so to see it that large was pretty breathtaking. EHS: Your formal training includes studies in medieval book production. What drew you to that subject and where can one study such a subject? CF: I always loved history and literature and began collecting poetry and writing it at a young age. During the 1970s, there was an ardent revival of hand crafts and many guilds and workshops sprang up. They continue to this day, as people begin to re-value the work of the hand. But it is very hard to find any instruction of this kind in regular schools anymore. But there are book arts centers in many areas that offer classes that teach traditional methods, including the occasional calligraphy class, and there are many calligraphy guilds still teaching scribal methods. But you can get a long way with self study and practice. EHS: On average, how long does it take to create one of your books, from conception through final production? CF: Anywhere from three weeks to many years! Seriously, there is usually a long deep thinking time. Then I might be in production phase for a few weeks, or longer. Seems to take a while to create a book, for me. But this year I have had seven new books spill out, so maybe I am shifting into a higher gear. EHS: Spelling Words explores the origin and evolution of the term “spell.” Did you uncover any interesting tidbit during your research for Spelling Words, something just really unexpected? CF: I was surprised to read that the root of the word “gospel” was “God’s spell” as in God’s story. These days, I suspect some God-believers might be uncomfortable with that. EHS: Star Spell examines how the old ways are hidden in plain sight in fairy tales and children’s rhymes, such as “star light, star bright.” I believe that “ring around the rosie” is another example. Can you cite some other examples of ordinary magic? CF: I think almost everyone has little rituals or actions that they feel will bring them luck or help with a bad situation. I am always on the lookout for these instances. Once when I had lost some money, a Hindu friend came by unexpectedly. When she saw how distraught I was, she wordlessly began tying a knot in her shirttail. She said it is an old custom when something is lost to make a knot in this way until it is found. Another is, “See a penny, pick it up, all the day you’ll have good luck.” And I do pick up pennies. So in simple ways I believe yes, we are practicing our own forms of magic all the time. EHS: Are you planning to adapt other rhymes or fairy tales, as you did in Star Spell? EHS: Some of your books quote the poetry of Mary Austin. How did you discover her work, and why do you find it so compelling? CF: I encountered her work in the land where she wrote it. I literally had never heard of her, and I have read a lot of books. In 2004, we were driving along the eastern Sierra, the desert side. As we drove into Independence, I was consulting my AAA map and noticed a sidebar that said “Home of Mary Austin.” I bought a copy of Land of Little Rain, and enjoyed her nature writing, as well as the writing she did about the American Indians of the desert. She writes sometimes of the “Dawn Mind” or “the days of the new” and seemed to be seeking spiritual wisdom by learning the stories and ways of her American Indian neighbors in the Owens Valley, and later in New Mexico and Arizona. EHS: Where can people find your works, both to enjoy and to purchase? CF: My book work is primarily on my website cariferraro.com:, galleries, online journal and library of writings. My commercial line of cards and prints and limited edition books can be bought from my proseandletters.com site. I also sell work though dealers and at exhibits, so you might see it at a book show. Sometimes antiquarian book shows will have contemporary manuscript books. My cards and prints are also available at Revels shows around the country during the December winter solstice season; I am a longtime Reveler and the wonderful shows have provided me with endless inspiration for my art. EHS: What suggestions can you offer to those interested in book making and binding? Good places to find supplies? CF: Self-motivation helps a lot. I was self-taught for many years before I found like-minded people, and then my skill set really expanded. It’s good to start with a beginner’s book , and to see if you like it enough to seek out a class or further instruction. My favorite supplier is John Neal Bookseller out of North Carolina, who sells pretty much everything you need for either calligraphy or basic bookbinding. EHS: What projects are you currently working on? CF: I have some commission work I expect to be working on throughout the fall. 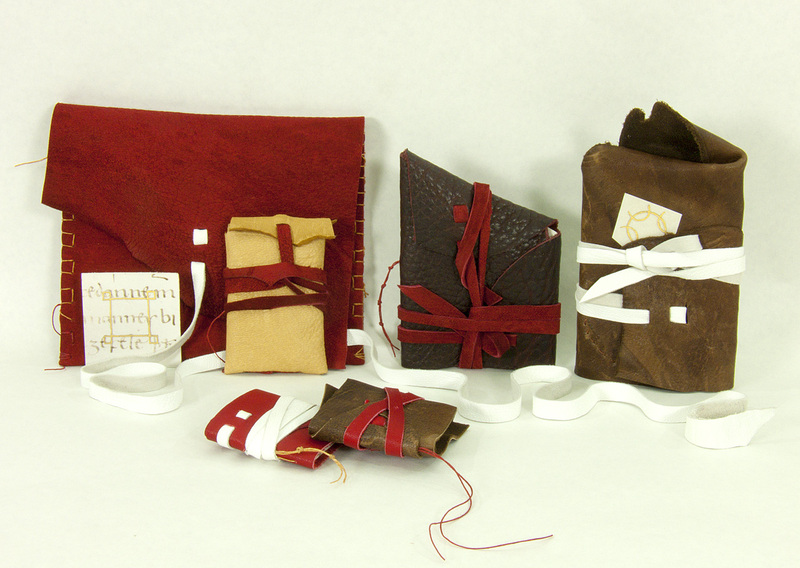 Summer was a restorative lull after the Beltane to Midsummer whirl, in which I did a corporate commission and then produced a set of small amulet-like books written on vellum offcuts and sewn into limp leather bindings, in time for an exhibit deadline. This is what I was thinking of when I said work can come out in a matter of days or weeks, but I have been in deep process with it for years already. EHS: Your new work, Five Medieval Childbirth Charms, demonstrates that women have been trying to control our bodies and reproduction since … well … forever. What drew you to these particular charms from Anglo-Saxon England? CF: I have a deep interest in women’s reproductive lives, and the language of these charms is that of taking power from and over what threatens a woman at this most dangerous time of life. Asking for a safe childbirth, or to recover from a lost one, is arguably the first use of magic and/or prayer. EHS: In doing research for the Five Medieval Childbirth Charms, what other examples did you encounter of women fighting to retain control of their bodies? CF: There are plenty of other charms, remedies and pregnancy spells in this and other manuscripts. There is even an Anglo-Saxon manuscript that describes the development of the fetus and when it does and does not develop a soul (though I have yet to find the actual manuscript; I have only read a detailed reference to it). When these particular charms were written down, it may have been a time when women’s reproductive rights were being threatened by the church fathers, but I don’t think this is necessarily true. The tenor of the instructions is quite matter-of-fact. 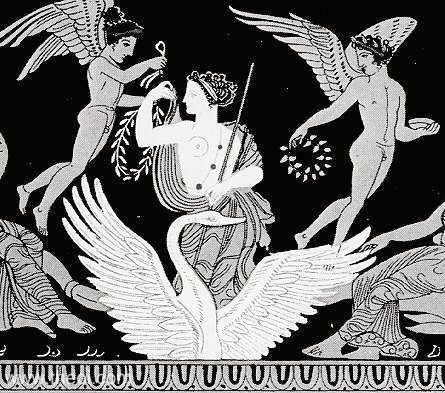 I believe there were enough vestiges still around of the old religion, which venerated Erce or Earth as the Mother of men. This would have a deep influence on the perception of women and their unique power as life-givers. EHS: Palimpsests are beautiful mysteries, words layered upon words like an archaeological mound. As an artist, what do you find most compelling about palimpsests, and how do you go about working them into your art? CF: The medieval charm books were the first time I’ve worked with a traditionally made palimpsest in an intentional way, to reproduce an imagined artifact from the past and write over it with another translation. But I have used layering in my work for years, in layers of color and text in many of my paintings. Even if I can’t read the underlayers, I feel their presence in the art as part of the magic of the image. And if some layers are more transparent than others, it can be far more interesting with more depth. EHS: Which conventions, art fairs, book fairs or other events will you be attending in the foreseeable future? CF: I do like to attend the exhibit openings of shows that I’m in and meet the other artists. This year has been a pretty fruitful one for me with exhibits. There is always a current list of shows recently past and upcoming on my blog sidebar, and as often as I can manage it, a review of my exhibits on the blog. The current exhibit I am showing in, Superstition 13, opened on Friday the 13th of September and will run through October 31, Hallowe’en, at San Francisco Center for the Book. I have three works in this show; for those who can’t come to the show, the catalog is really stellar. The title Superstition 13 reflects the theme of magical and occult books, and I had work ready to enter when I first saw the call for entries. Beyond my own shows, I like to visit book art shows like the Book Arts Jam and the Codex Book Fair and see what other artists are creating.